This week around 20000+ government jobs will be closed down by each passing day. Candidates searching for reputed government jobs should take no time to apply for so many jobs listed below. Government jobs closing this week consist of some well known organization name along with important job posts. Each post carries numerous vacancies and should be in the list of job seekers to apply soon. Candidates residing in Tamil Nadu or nearby area of the state can apply for jobs as Constable and Nurse. The state has issued notification to fill up around 17000+ jobs and last dates are approaching. The highest vacancy of 15000+ posts for Constable is issued by Tamil Nadu Police. The last date to apply for this gigantic vacancy is 22 February 2017. The other job post is issued by MRB Tamil Nadu where job vacancy of 2804 Auxiliary Nurse Midwife Post is to be filled up. 24 February 2017 is the last date to apply. 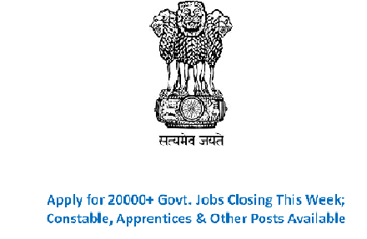 Other than this, there are posts vacant for Apprentice, Faculty, Technician and various others. All the jobs will end this week. Candidates willing to have government jobs need to take a look at the details given below for each job post before applying. Eligibility section should be read thoroughly by any aspiring candidates before applying. This will help you to know whether you can apply for the job or not. Different job profile carries different educational criteria, experience for the post and age limit. Applying for that job is possible only after candidate meets the entire eligibility criteria. The jobs posted below will entire this week. Do take a look and apply fast.